Frame is made of rectangular pipe / Round Tube. Top is made of perforated sheet. It has 2 Section Top made of perforated Sheet. Back Rest Section is manoeuvred by Screw Handle from Foot End. Tubular Head & Foot Bows are of equal height with vertical tubular supports mounted on wheels. The Bed is mounted on 10cm Dia Castors , 2 with brakes. Safety Side railings can easily be drop down. Product Size : 137L x 76W x 60H cms. 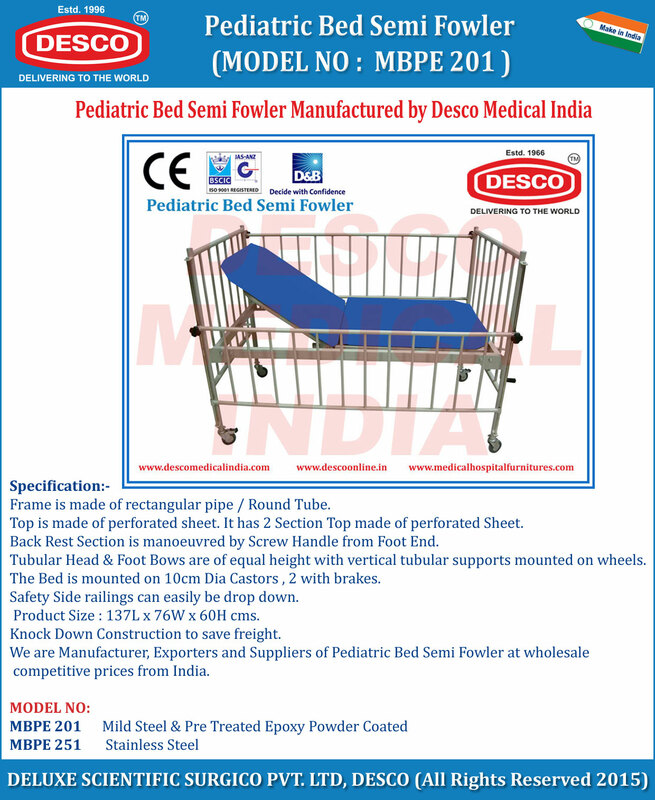 We are Manufacturer, Exporters and Suppliers of Pediatric Bed Semi Fowler at wholesale competitive prices from India.